CPMS PTC's Art Lit leadership team is proud to announce the three units for 2017-18. Ancient Egypt, Roy Lichtenstein and Diego Rivera/Frida Kahlo will all be featured this school year. The Art Lit program at CPMS is slightly different from the elementary model. Each grade will watch and listen to an educational slideshow in the gym, presented by Art Lit chairs MaryBeth Piccirilli & Daphne Teals. Students and volunteers then break out into their classrooms to take part in a hands-on project. Volunteers are given all the supplies necessary to complete the classroom project. Teachers remain in classrooms, helping to ensure classroom management while students complete their piece. The entire experience is an awesome opportunity to see your child's classroom first-hand and participate in their day. Wed, October 11, 2017– POSTPONED as of 10/4. New date coming soon. New this year! Interested art lit volunteers will have an option to attend a preview day for each artist. This will allow them to get a sneak peak into the artist and the project prior to the official Art Lit day. 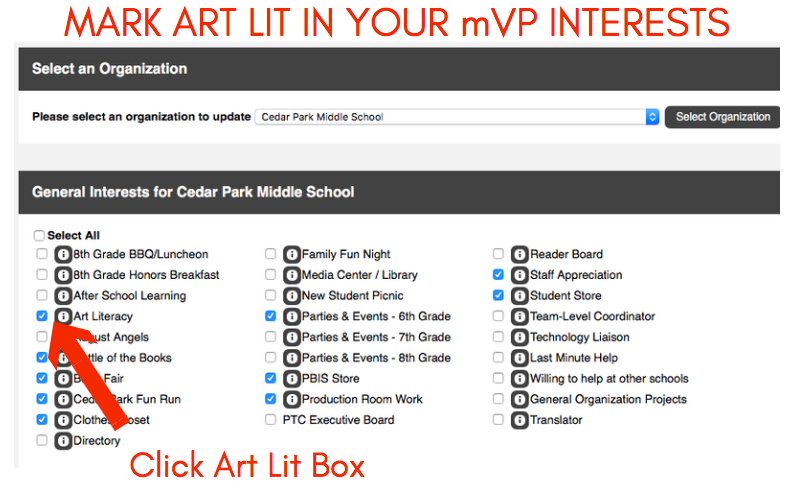 If you would like to be included in the CPMS art lit database and be invited to these preview days, please mark Art Lit in your mVP interests. Update your preferences through the myvolunteerpage.com (mVP) system. Select My Profile-> Interests and mark Art Lit. The CPMS Art Lit program is funded by the PTC and your 5K donation. All questions can be directed to MaryBeth Piccirilli & Daphne Teals.